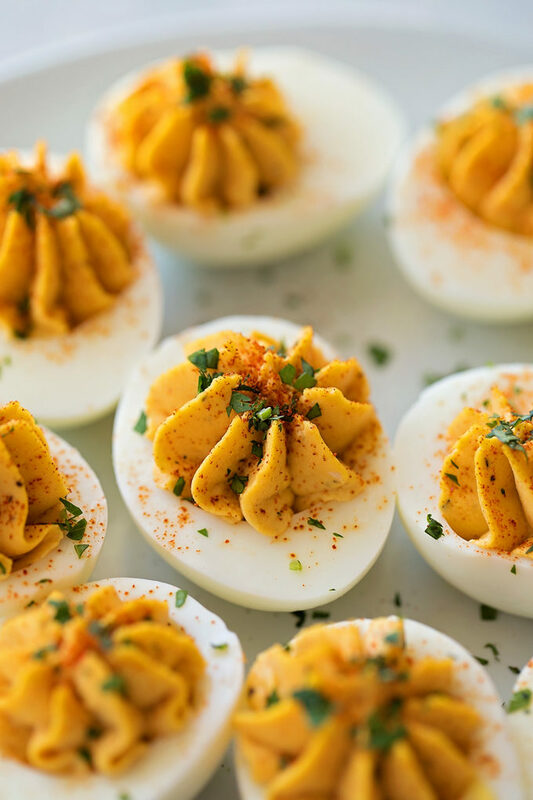 These dangerously good deviled eggs are a tasty twist on a springtime classic. They’ve got a few secret ingredients that make them extra addictive! Let’s talk about cooking the eggs first. 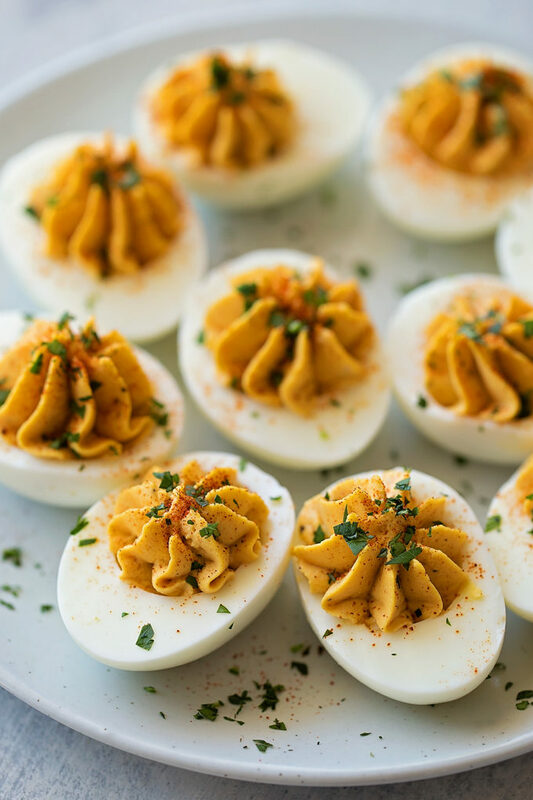 I’ve always struggled with getting boiled eggs to cook right AND to peel without making a mess. That was until I tried steaming them instead of boiling them. It made all the difference! After 15 minutes, drain the water and fill the pot half way with cold water and 2 cups of ice. Let sit for 10 minutes. They will peel beautifully. You can also refrigerate them and peel them later without any problems. 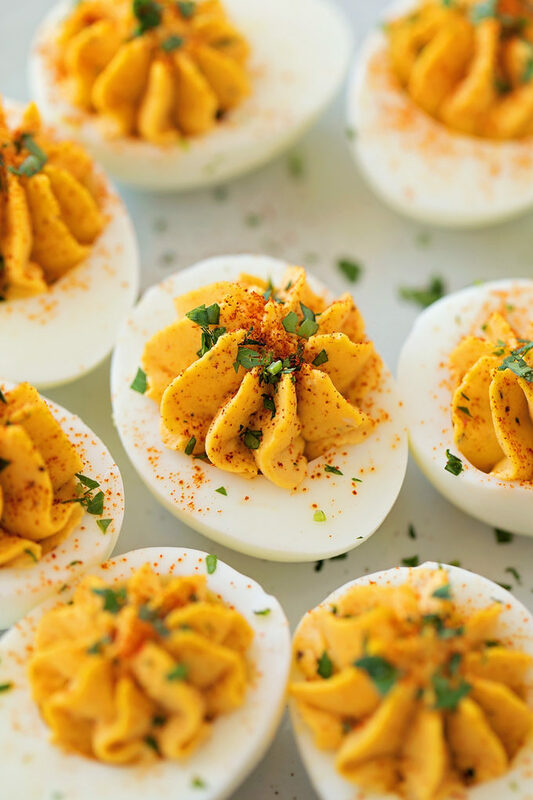 I haven’t boiled an egg in years because this method is SO amazing! P.S. if you have an Instant Pot you can use this method too. Just add 1 cup of water, set the rack in, place eggs on top and hit LOW PRESSURE for 12 minutes then use the manual or quick release method. Continue with ice bath. 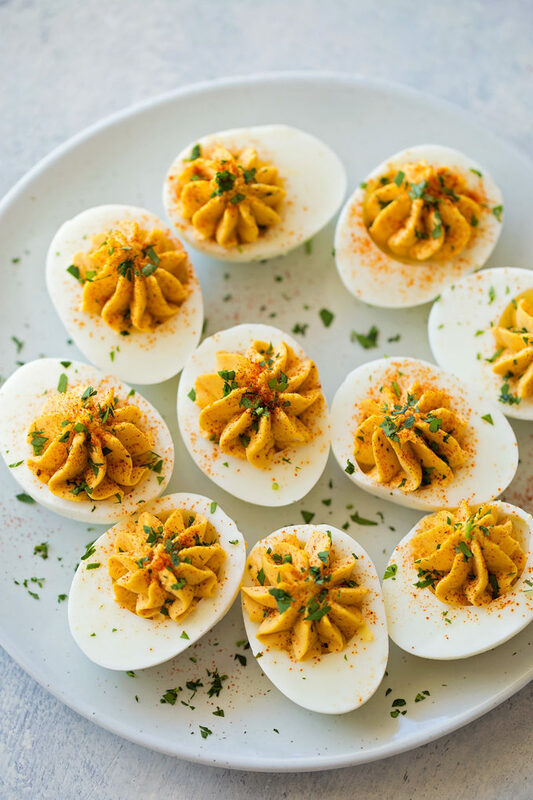 Once the eggs have been peeled, cut them in half lengthwise, remove the yolks and add them to a small mixing bowl (or a mini food processor). 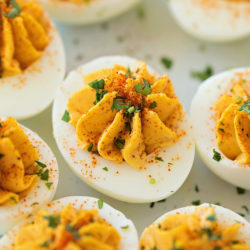 Add the mayo, dijon, dried mustard, DILL PICKLE JUICE (instead of straight up vinegar), worcestershire, paprika, ground black pepper and a pinch of salt and cayenne (or hot sauce). Mix until smooth. 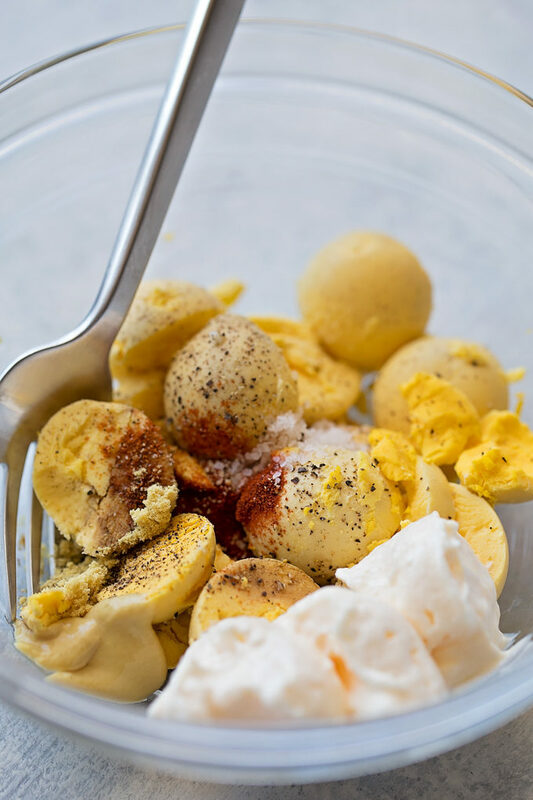 In a small mixing bowl (or a mini food processor), the yolks, mayonnaise, dijon, mustard, pickle juice, worcestershire, paprika, black pepper, salt, and . 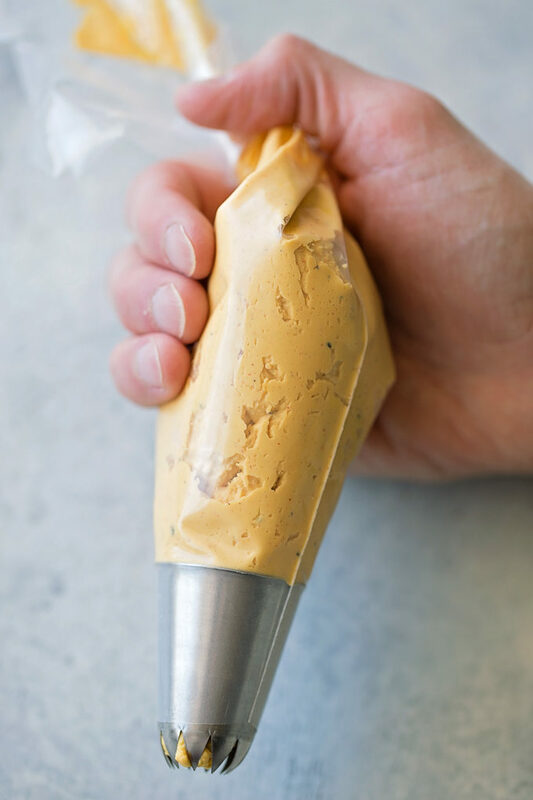 Using a fork, mash until really smooth. In a large piping bag fitted with an extra large star tip, place filling inside. Pipe into halved egg whites. Garnish with additional paprika and parsley or chives, if desired. – Crumbled bacon is also a delicious garnish.